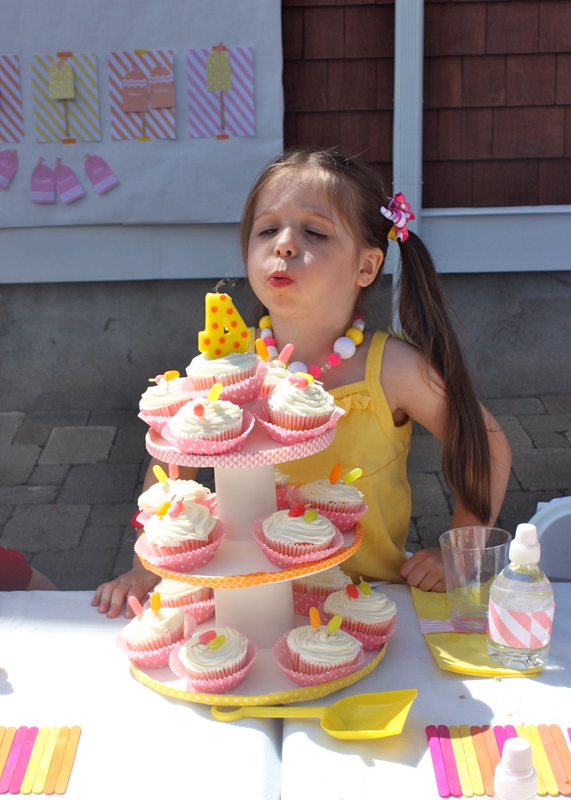 Molly’s been saying, “I can’t believe I’m going to be four,” for months now. It is so cute when she says it. Well the day finally came- my baby is 4! It’s hard to believe that everyone in my house is now potty trained, sleeping through the night, and eating regular food. The past eight years were a whirlwind, but we reached the light at the end of the tunnel and things are getting easier in some ways. On to the party! 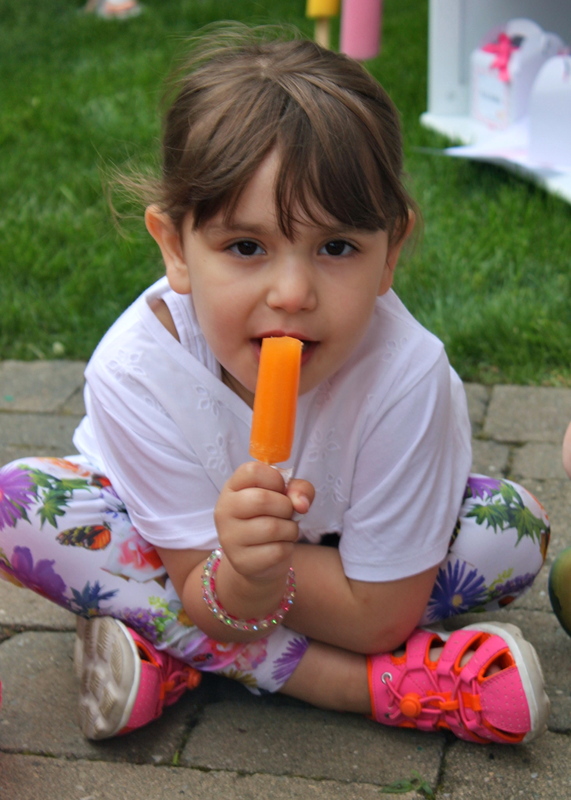 Popsicles are Molly’s most favorite sweet treat in the world so it was no surprise that she’d choose a popsicle theme for her birthday party this year. I started with this printable package I found from Cupcake Wishes Store on Etsy. It was exactly what I was looking for and the colors the perfect coral, peach and yellow. It was the perfect afternoon for a backyard party, with the exception of the 15 minute rain shower we got as the guests were arriving but it passed over quickly and the kids barely noticed. 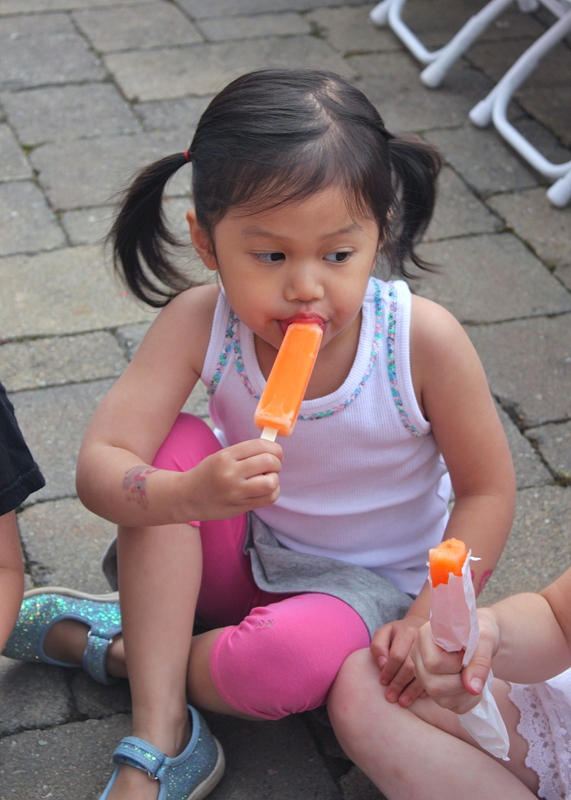 We had 16 kids attend and they all enjoyed an afternoon of popsicle fun. We ate popsicles, played pin the popsicle on the stick, made popsicle crafts, and hit a popsicle shaped pinata. 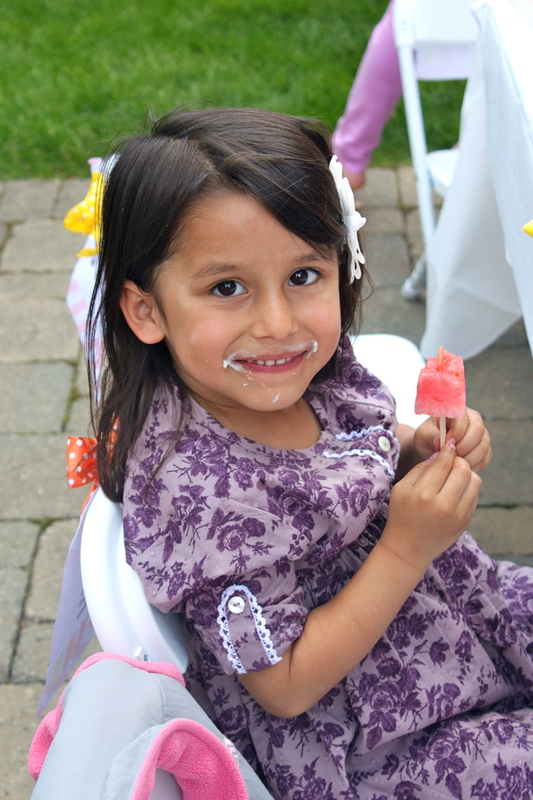 Molly had a fantastic time and was very happy with her popsicle birthday party. I set up a long kids’ table on the patio and decorated with pink, yellow and orange. I made the runner for the table using colored popsicle sticks. Have you heard of kinetic sand? If not, you should get some! It is sand that has a soft texture but never dries out and does not make a mess. It is fun for the kids to play with. I used two boxes of it to create the centerpiece. I found the sand at Michael’s Crafts. 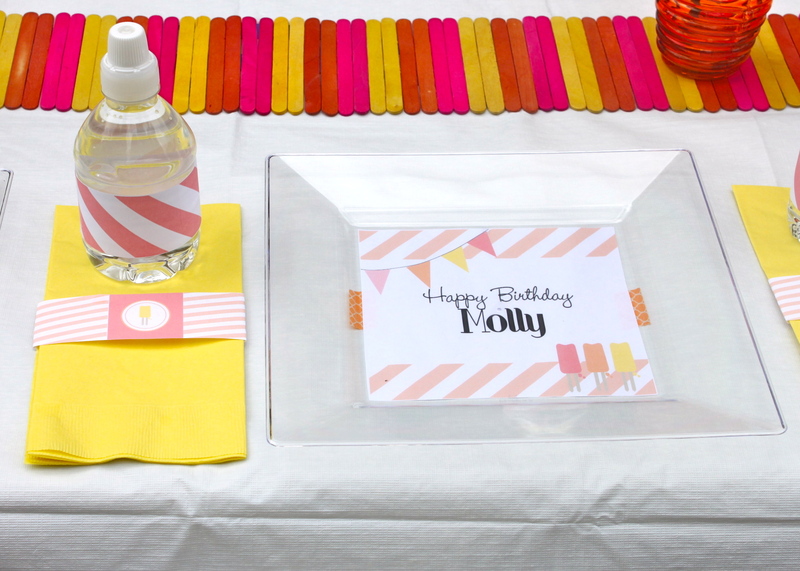 For the place settings, I taped a sign from the printable collection under a clear plastic plate to create personalized party ware. And wrapped a napkin and a water bottle with a strip of striped paper to add a little color to it. I only served finger foods, so utensils were not necessary. 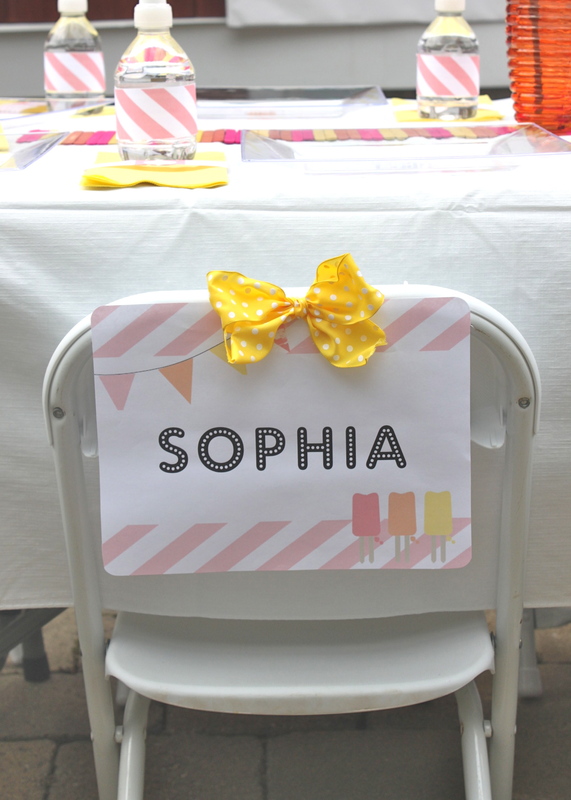 Each guest sat in a chair which I personalized with their name and printable sign from the printable collection. This is the treat table. The banner was made using popsicle sticks which I covered with Washi Tape, paper printables from Cupcake Wishes Store on Etsy, and ribbon. I glued popsicle sticks into a star shape for either side of the banner. Molly wanted cupcakes instead of a cake so I made strawberry flavored cupcakes from a box with white icing. Did you know Mike and Ike’s look like popsicles if you stick a toothpick in them? So cute and so easy! Can’t have a popsicle party without popsicles, so I put them on ice just before the guests arrived. 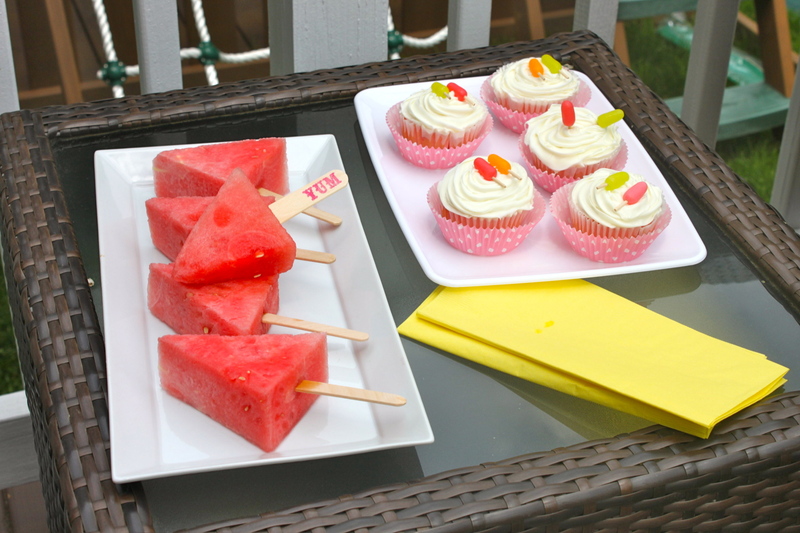 Carrie Budke of AngelCakes made the popsicle shaped cookies. They came out super cute. I always like something healthy on the table, so I opted for watermelon which I cut into triangles and put them on a popsicle stick. An instant watermelon popsicle- I bet they would be great frozen too. I was short one table, so at the last-minute, I decided to bring a bookshelf outside and used it to hold the party favors and a drink station as well. It worked out really well. I used the sand bucket to hold the ice and served regular and pink lemonade in these beverage containers that I recently found at Kohl’s. I love them! This station was a hit with the kids. They got a kick out of filling their own drinks. 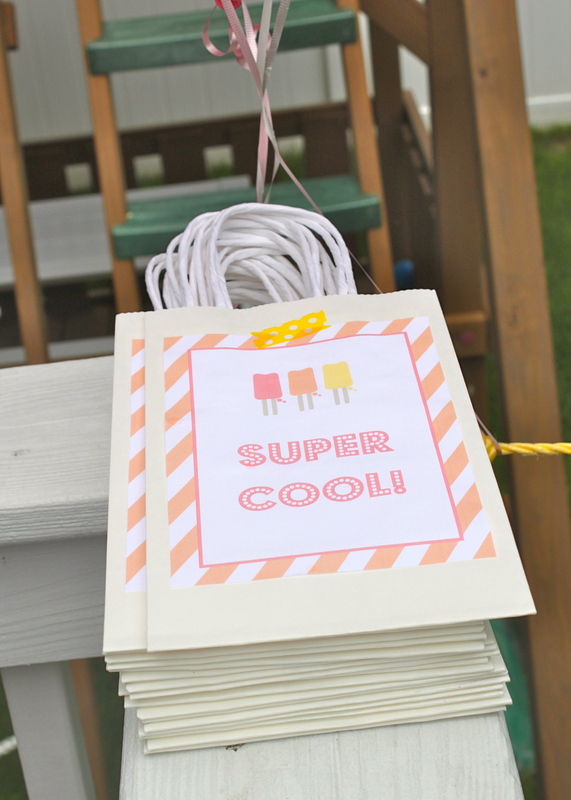 For party favors, each guest got a personalized favor box with a popsicle mold to make their own popsicles, a popsicle bubble necklace and a freezer pop sleeve from Metal Mom Boutique on Etsy and a bundle of Freezer Pops. I set up a little seating area for parents who stuck around with some “Poptails” and treats for them to enjoy as well. 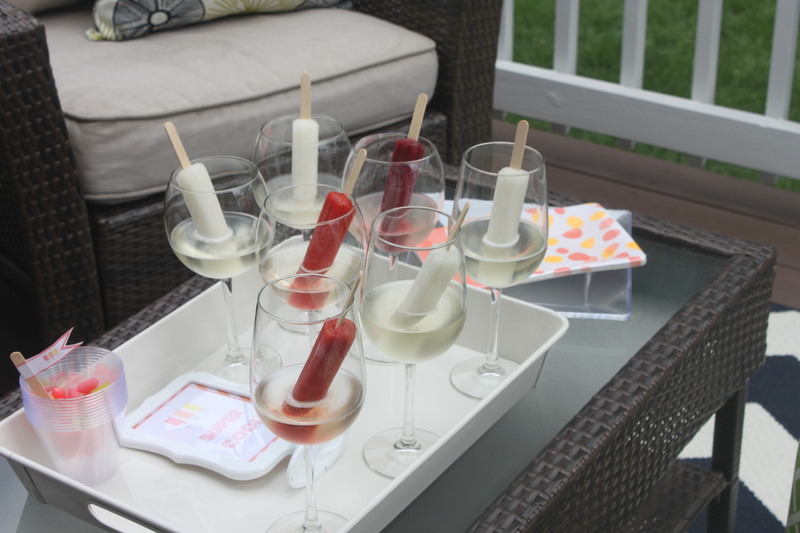 A poptail is a little Prosecco or Champagne poured over a popsicle. Yum! 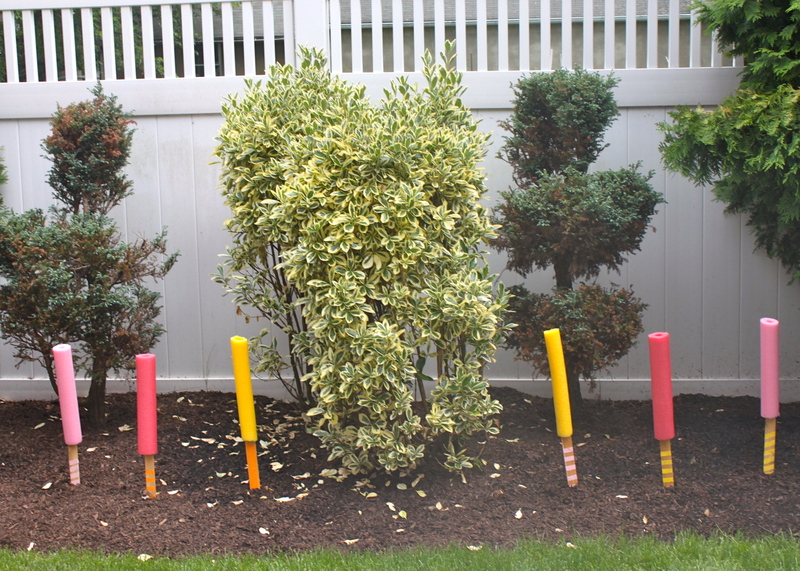 Decorating my yard is a challenge. We don’t have any place to hang things from, so I borrowed this idea I saw on Pinterest…pool noodles and wood strips make cute little popsicles. I stuck these around the yard and in the garden. The kids each got a little bag to collect pinata treats. 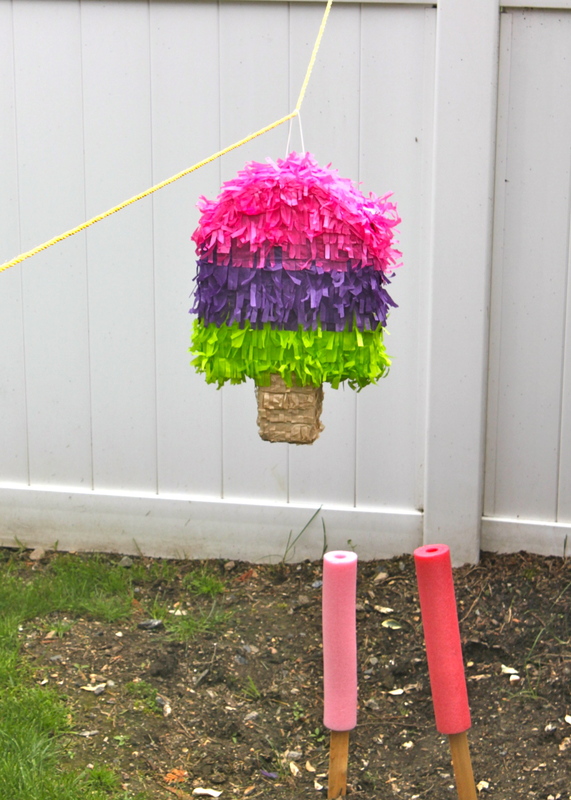 The pinata got busted open after two hits but at least Molly was able to get a shot at it. For the Pin the Popsicle on the Stick game I personalized a paper popsicle for each guest and simply glued popsicle sticks on the striped paper. At first it served as a nice backdrop and decoration for the party. Then all the kids were blindfolded and had to try to stick their popsicle onto one of the sticks. Many were able to land on or close to a stick. In addition to the games, I had popsicle crafts set up on a craft table. 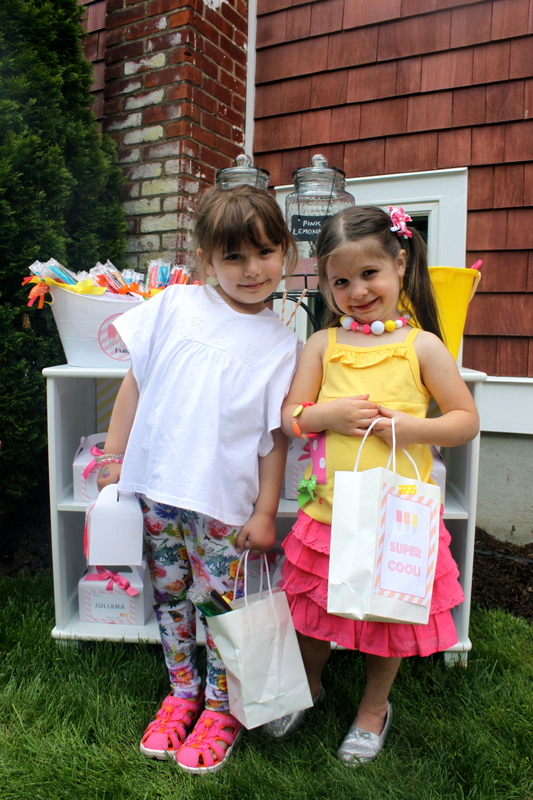 They were able to decorate popsicle stick frames, foam popsicle magnets, and popsicle scratch art. 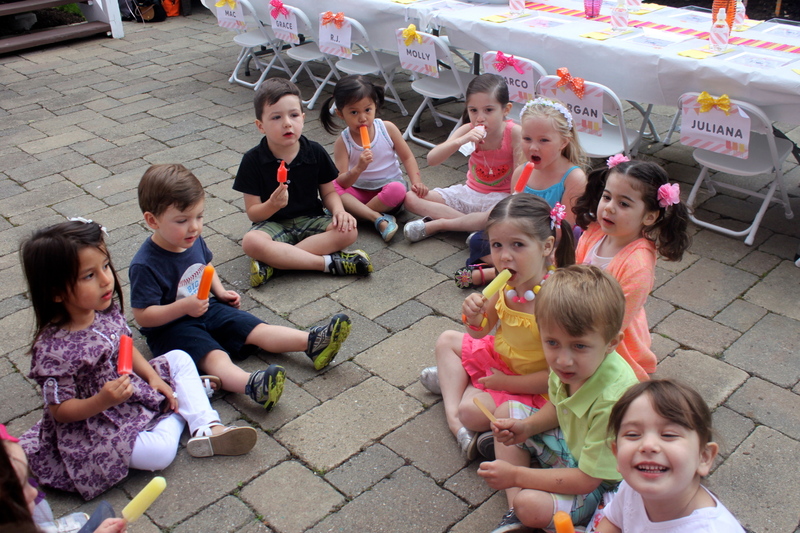 I think the best part of the party is when they all sat around together eating popsicles. 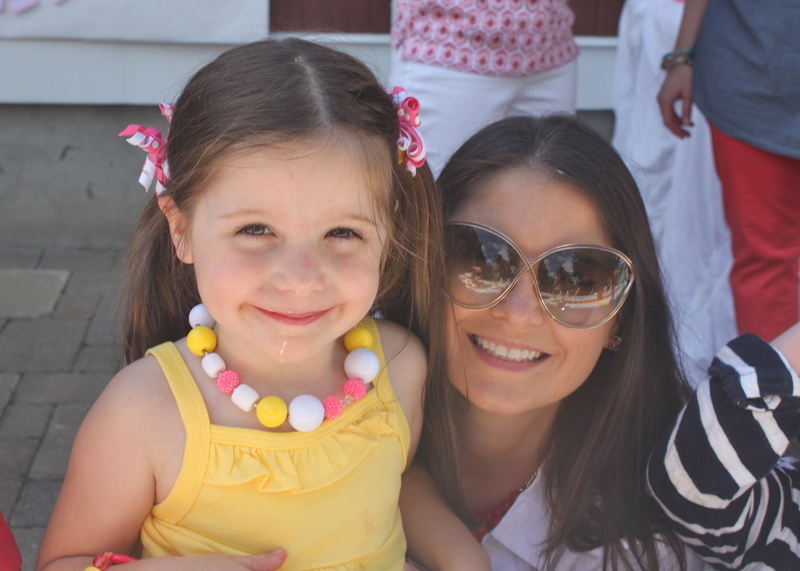 All in all it was a beautiful day and beautiful party for a beautiful four-year old. I’m glad I can make her party theme dreams come true. Happy Birthday, my sweet Molly. Mommy loves you! I’m interested in your decorations for parties, my daughters birthday is few months from now and i want to know more about your decorations. Can you please get back at me, thank you.